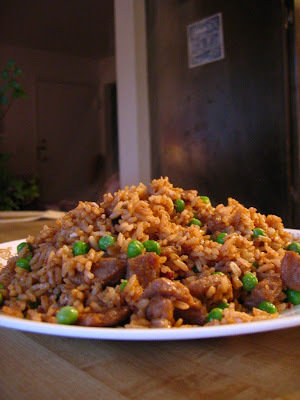 This post contains simple instructions on how to make fried rice. This recipe is so easy and so laughably cheap that I just have to share it with the world. It dates back to my college days when a friend of mine named Tracy taught it to me. Money was tight back then, so needless to say this recipe instantly entered my heavy rotation--and it's been there going on 17 years now. But the best thing about this meal is that it costs less than one dollar to make. Seriously. 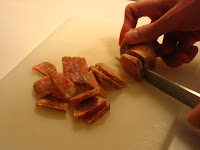 1) Slice up the sausage link into small chunks and fry on medium heat in a non-stick pan. 2) Add the rice. Be sure you break up any clumps of rice. You can add cayenne pepper to the rice if you want a spicier dish. 3) Crack egg into a glass and beat with a fork. 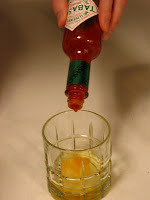 I add a few good splashes of Tabasco to the beaten egg. 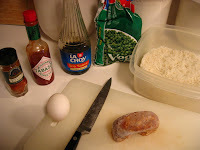 4) Add egg/Tabasco mixture to the rice and sausage in the pan. Stir with a spatula until combined evenly. 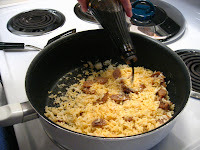 5) Shake four or five healthy splashes of soy sauce onto the egg/rice mixture (err on the side of caution here and don't add too much or the dish will be too salty--you can always add more soy sauce later if need be). 6) Turn burner up to medium-high. Continue stirring constantly and be careful not to let the rice burn. 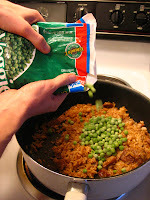 7) Dump in a couple of handfuls of frozen peas. Cook for another 4-5 minutes more on high heat, stirring constantly. I knew that MBA would pay off eventually...! If you're looking for other inexpensive recipes like this one, you can visit here, here and here. OOh yummy! I'll have to try yours using hot sauce and sausage. Try mine, too! I used chicken and Sriaccha. Delish! In Hawaii we use Spam. It never occurred to me to use Italian sausage, but I've used crumbled bulk breakfast sausage or Spam. I think I need to cook some rice! Let me know how it comes out Sally! For us, frozen sausage links are just easier to handle. This recipe is all about maximizing convenience. Then: Instead of the beaten egg, you use 3 to 4 generous tablespoons of tofu (not too firm). You put it in a glass and squash it with a fork until it looks like a cross between scrambled eggs and finely ground meat, texture-wise. 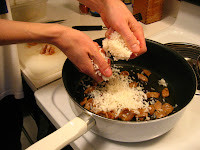 Then, add a dash of soy sauce, some black pepper, some nutmeg and a bit of salt (tofu is very bland). I like to add sriracha and garlic or hoisin sauce as well, but that's because I love spicy food. You need to prepare the egg replacement before you start cooking, so it can marinate a bit. A quarter of an hour was fine for me. I'd recommend to start cooking by frying the egg replacement for a bit before you add the rice (so it's exactly the other way round than in the original recipe, if I remember correctly).